The stadium of the 1952 Olympic Games is going through major renovation, renewal and construction. Completed in 1938, this landmark complex is being developed into a multi-purpose arena that will meet the requirements of international sports and culture events while providing daily services to Helsinki citizens and tourists. It is estimated that the revamped stadium will attract about one million visitors annually. The stadium will encompass 19,290 brm2 of additional space. In addition, the seating and field areas and running tracks are renewed. The total scope of the project including the above is 90,000 m2, and the cost is estimated at 261 MEUR. The canopies that cover 16,000 m2 consist of 2,800,000 kg of steel. The project uses 441 precast concrete units and about 33 500 m³ of concrete in total. Excavations are needed for a volume of 150,000 m³. The project is to be completed by the end of 2019. Sweco carries the overall responsibility for the structural design and planning of all construction phases including excavations and prefabricated products. BIM is the main design method for both new and renovated sections. After the renovation, all seating areas will be covered. There will be six times more space for catering and services, the safety of the area is improved by adding emergency exits. Based on the needs assessment, the largest improvements include the roof of the main seating area and a building services tunnel to circle the whole stadium under the running tracks. The huge steel canopy built on top of the seating structure has required reinforcement of the old concrete frames as well as new bracing structures. Due to the new rooms built under the frames, they have been extended downwards for more than ten meters. Due to FIFA standards, the column span of the canopy is extremely long, which has led to using massive steel trusses. The building’s geometry is another challenge as each truss is unique. The canopy’s dynamics have been studied by wind-tunnel testing and flow calculations, and its forces have been directed to affect the reinforced structures underneath by using structural bearings. Excavations around the existing structures require inventory and accurate modeling and coordination of the support structures. Nearly all new rooms are located underground. Their geometry is a challenge because the structures are curved and elevated at various levels. The decks consist of massive, post-stressed beam grids and slabs. Their and support structures’ loads are heavy due to their own weight, the landfills and payloads. Partially floating, the curved reinforced concrete canopy green roof on top of the deck of the northern logistics center is a specialty feature. The nameplates of the project donors will be attached to its facade. Its design required accurate knowledge of the characteristics, thermal motion, detachments and detailing of the structure. The schedule of the project has kept, however, and potential problems have been solved in weekly Big Room sessions. Joint innovations have earned savings on the construction costs. Laser scaling of the excavated rock faces was utilized in design in many ways, and the inventory of the existing structures was imported to the building information model. The model helps the design and construction disciplines perceive the challenging geometry. The project involves a vast amount of building services penetrations, the reservations for which have been coordinated with the help of the model. Modeling helps perceive the executability of densely reinforced concrete structures, all the interfaces to be matched in the large project, and creating a structural calculation model based on its challenging geometry. The project involves extensive and versatile collaboration between the client, the contractor and various design and expert organizations. 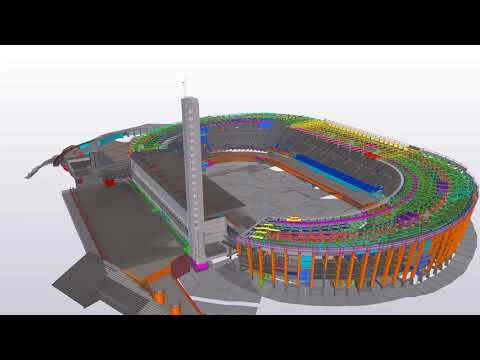 In addition to the Sweco environment built on Tekla Structures, the project team has used various software programs, including Tekla BIMsight, Trimble Connect, Strusoft Fem-Design, Dlubal RFem, Ansys Mechanical, IDEA StatiCa, Autodesk Simulation Mechanical, Autodesk Robot Structural Analysis, Peikko Designer, Hilti Profis, Adapt-PT, AutoCAD, ArchiCAD and MagiCAD. The data is mainly transferred in DWG, IFC and Tekla Analysis model formats. Tekla and other IFC models are used on mobile devices with the help of the Trimble Connect application. Moreover, the native Tekla model of the steel canopies is shared among the design agency, the construction site and the fabricator using the Model Sharing function. The data of the drawings and IFC models of the new steel structures in the seating areas has been shared using Trimble Connect. The process is monitored based on assembly status specified by the project parties. Sweco used the IFC models of the other design disciplines as references in creating its model and modeled the steel canopies separately using version TS 2016i. The IFC models of the structures supporting canopies were then transferred to the TS2016i model. The project used Sweco’s own drawing templates, macros and components. In addition, Peikko Group, among others, used the database file of the model to manufacture the Delta beams. Beam information was moved from the Tekla model directly into the ERP system. Architect: Wessel de Jonge Architecten BNA B.V.